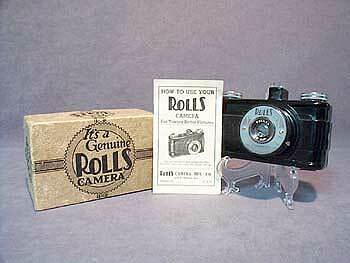 Rolls Camera Manufacturing Company in Chicago, Illinois made this terrific vest pocket size camera. Made to produce 1-5/8" x 2-1/2" photos, the lens is a Rollax 50 M.M. The face plate, as well as the box, features striking black on silver Art Deco design elements. The original cotton packing is still in the box, which shows light wear and one torn corner, but is in overall in good condition. This great camera does not appear to have been used at all, and is in mint condition.